Only one entry per person allowed per Giveaway. *All information must be completed for valid entry. TERMS: NO PURCHASE NECESSARY. Void where prohibited. Giveaway is open to legal residents of continental US. ELIGIBILITY: Must be twenty-one to win. WINNER NOTIFICATION: Winner will be chosen at random within 48 hours of the end of the entry period. Winners will be notified via email and/or phone. Winners must claim their prize within 5 business days of notification. CONDITIONS: Prizes are transferable. No cash redemption or substitution will be allowed. 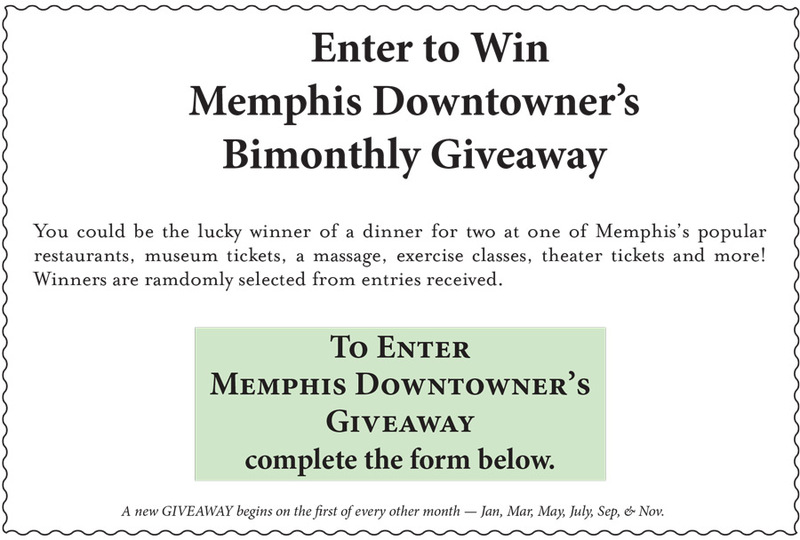 By participating, where allowable by law, entrant grants Memphis Downtowner and its Giveaway sponsor the right to publish, broadcast and use in any media, including the World Wide Web, participant’s name, picture, and likeness, for prize announcement purposes without additional compensation. Your information is confidential and will not be shared.